Hidden drinking dens are a dime a dozen in New York – if you’re in the know. Take, for example, Please Don’t Tell, accessed via a 1940s wooden phone booth inside Crif Dogs (and the only time we condone drinking and dialling). Then there’s the Blind Barber, a barbershop by day, lounge by night; Angel’s Share, hidden within a Japanese restaurant; and East Village institution Death & Co, the watering hole of choice for casual tipplers and professional bartenders alike. New York’s Prohibition days may be long behind it, but the city’s discerning imbibers are still seeking thrills in sumptuous speakeasies and clandestine cocktails. Here, we pull up a stool to NYC’s finest new-generation bars with old-world charm, all put in one single platform. We’re talking about an amazing city guide app called NYC Bars: Guide to Speakeasies and Historic Bars, now available for Android devices. Perfect for users that want to discover the best NYC speakeasies and explore hidden bars with historic significance, NYC Bars is easy to use and designed with tons of useful features and information about all places integrated in it. Let’s see what it has to offer. 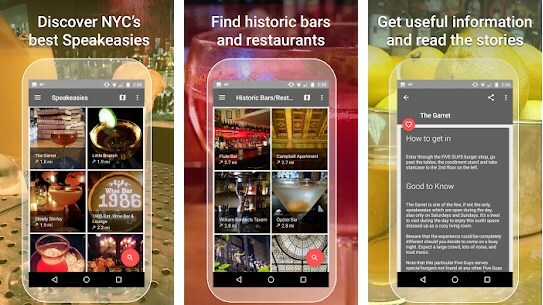 NYC Bars is a feature-rich app, developed with friendly user interface, so you can easily find exactly what you’re looking for. Explore the best historic bars and New York speakeasies, make a regular night out a real memorable experience by using this local guide app. The app features some of New York's best speakeasies specializing in Prohibition Era cocktails as well as old bars carrying a small slice of New York history. Just browse through the plethora of amazing places, tap one place and view detailed information about it: working hours, average drink prices, happy hour info, photos, real customer reviews, easily make reservations, find the exact location with the map, etc. Furthermore, you can add your Favorites to your own list and read fun articles and stories about these places. Find practical and useful details about hundreds of speakeasies, hidden bars and restaurants in NYC, enjoy this city even more by downloading NYC Bars from the following Google Play link.